A unique and entertaining aspect of chinchillas is the way they clean themselves. Since their thick fur resists air drying, chinchillas do not bathe in water. Instead they enjoy "dust baths," rolling around in fine dust powder in order to clean grime and oils from their coats. In the wild they prefer the powder of ground volcanic rocks, but as pets a very fine pumice powder works best. 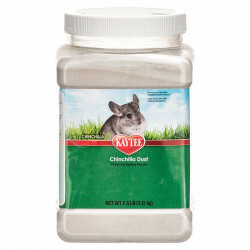 Chinchillas should have their dust baths a few times a week in order to maintain a clean and healthy coat. Providing your chinchilla with a special "bath house" will help keep the dust mess from spilling over into its cage or onto your floor. 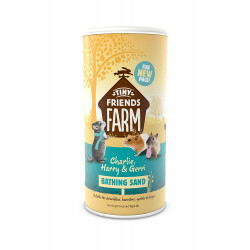 Small pet bath sands are specially designed for your pet's complete health and safety. 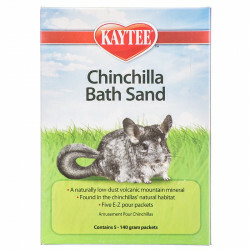 Made of naturally low-dust volcanic mountain minerals found in the natural habitat of chinchillas, bath sand is easy to pour and creates virtually no mess.